Pam Africa, Minister of Confrontation for MOVE and Chairwoman of the uncompromising International Concerned Family and Friends of Mumia Abu-Jamal, will visit Madison and Milwaukee Wisconsin June 26-27. Pam Africa is a longtime political activist and MOVE leader. 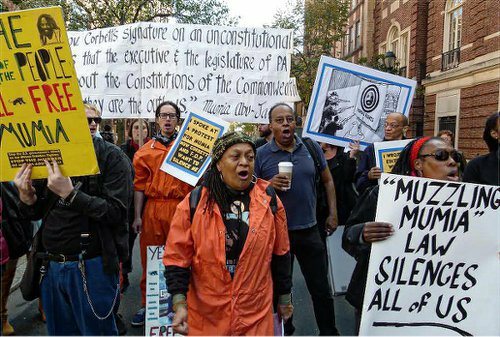 The MOVE organization has faced government persecution for decades including having numerous members unjustly placed in prison since the late 1970’s and a bombing of its home by city officials and police in 1985 that killed 13 of its members. Sister Africa will demand the freedom of political prisoners Mumia Abu-Jamal, Leonard Peltier and the MOVE 9 and speak out against state violence against communities of color such as the massacre of 9 African Americans in Charleston, South Carolina by a white supremacist terrorist. During her speaking tour, Ms. Africa will be joining those fighting back against union-busting and austerity in Wisconsin. Friday, June 26, 10 a.m.
Friday, June 26, 6:30 p.m.
Saturday, June 27, 11 a.m.
Saturday, June 27, 1-3 p.m.